As an event entertainment production company serving New Jersey, New York City, Philadelphia, Maryland, Washington, DC, and nationwide, we have performed the due diligence to become keenly aware of the event venues that we provide our event services to. This unique knowledge along with our extensive array of authentic event services allows us to inform & educate our event clients. This potent combination provides our clients the peace of mind that they have made the proper event decisions for their own event. 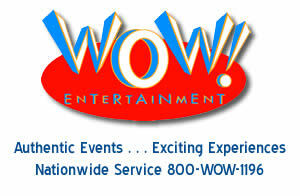 WOW Entertainment began in 1997 and to learn more about our history and the individuals that comprise our company please visit About Us. We look forward to working with you on your next event, whether it is a trade show, corporate event, wedding reception, bar & bat mitzvah, or surprise birthday party.